His Beatitude, Metropolitan Tikhon marked his namesday—the Feast of the Glorification of Saint Tikhon, the Apostle to America—by presiding at the Divine Liturgy celebrated in the Monastery Church of Saint Tikhon of Zadonsk here on Wednesday, October 9, 2013. Among those concelebrating were His Grace, Bishop Michael; His Grace, Bishop Mark; Abbot Sergius; Archpriest Dr. Steven Voytovich; and the clergy of Saint Tikhon’s Seminary. 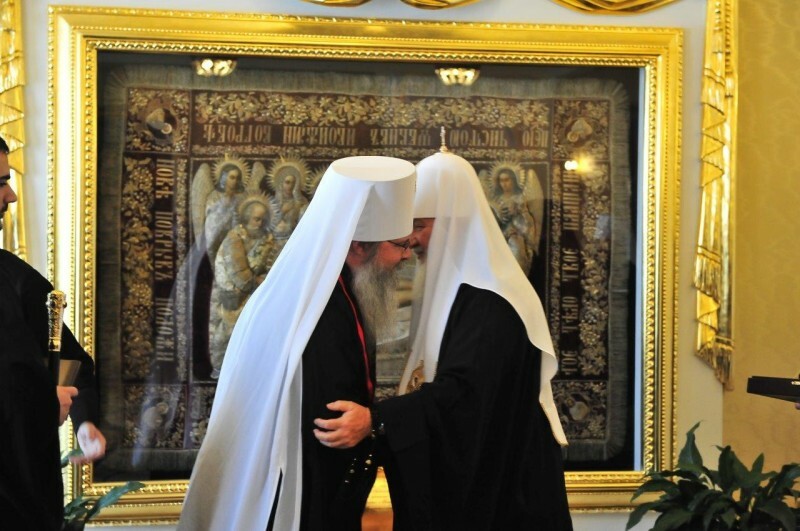 Among the greetings received by Metropolitan Tikhon was the following letter sent by His Holiness, Patriarch Kirill of Moscow, the text of which reads as follows. “Prayerfully concelebrating with Your Beatitude the commemoration day of your heavenly patron, St. Tikhon, Patriarch of Moscow and All Russia, I cordially greet you with your Name Day. “I wholeheartedly wish you the inexhaustible God’s help in your primatial care for the strengthening of the Orthodox Church in America, good health and abundant spiritual gifts from our Heavenly Father. A similar message was received from His Eminence, Metropolitan Hilarion [Alfeyev] of Volokolamsk, which reads as follows. “Your Beatitude: I cordially greet you on the occasion of your Name Day—the commemoration day of your heavenly patron, St. Tikhon the Patriarch of Moscow and All Russia. “Receiving spiritual support by the intercession of this God’s saint, one of the most revered first hierarchs in Russia and the whole Orthodox world, and studying carefully his missionary work in America and the heroic deeds which he performed as a confessor in Russia, you strive to herald zealously the words of eternal life (John 6:68) to those near and far, teaching the faithful to glorify and thank God Who according to his abundant mercy hath begotten us again unto a lively hope by the resurrection of Jesus Christ from the dead (1 Peter 1:3). Copies of these greetings in the original Russian and the English translations that accompanied them may be found in PDF format.